The pumping system that is dedicated to each membrane train in the treatment plant may work at different hydraulic conditions. Each train may be at a different operating pressure due to membrane age, need for cleaning, etc. One way to deal with the variability is to replace the traditional motor arrangement of the pumps with more efficient vertical turbine pumps that are under the control of variable frequency drives. The VFD is sized for the motor to which it is attached, and they are both used to convert electrical energy into efficient mechanical energy. In traditional induction motors with constant speed driver, throttling valves must be used to control the required membrane train pressure. These throttling valves waste pumping energy. They make use of a more direct and efficient control mechanism, since they remove the need for throttling valves. Because their setup is not as complex, they are easy to maintain and repair. Their system of operation is more streamlined, so that any problems can be easily identified and deal with. They improve the efficiency of the motors, leading to better power conversion and thus saving both time and money. This is the part of the equation that carries the most significance for the owners who invest their resources in the membrane plants. Thanks to the variable frequency generated by the drives, the flow through the membrane systems can be controlled and optimized in a better manner. Motor damage during starting and stopping is reduced, as well as the risk of power line disturbances. The life of the motor is significantly extended. Make sure to use a non-slip solid state VFD which can save energy by matching the hydraulic load requirements with the energy consumed at any given moment. Make sure to pick the right motor to be used with the VFD, motors that are VFD-rated, capable of handling the demand made on the system. The gathering of dust on VFDs is a constant source of contamination that can have serious consequences with the equipment malfunctioning or diminished performance, so always remember to keep the drives clean and in a climate controlled area. When conducting mechanical inspections, remember to check the internal components of the VFD as well for signs of foreign objects or any kind of bearing failure. 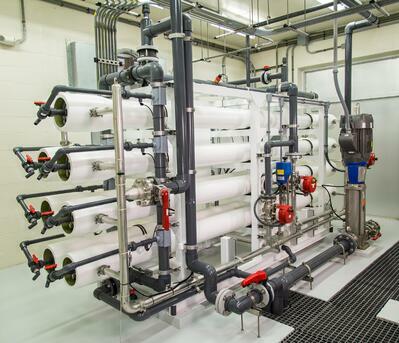 Incorporating VFDs in membrane plants is the natural choice for treatment plants that are looking to improve the general efficiency of their system of operation without compromising on quality.